But Tusk, standing by Irish leader Leo Varadkar, warned once again that the divorce deal May agreed last year but failed to sell to her parliament will not be reopened. Neither will the deal’s “backstop” that ensures an open Irish border, he said, damning the British eurosceptics pushing for an abrupt “no deal” departure. “I’ve been wondering what that special place in Hell looks like, for those who promoted Brexit without even a sketch of a plan how to carry it out safely,” Tusk said. Offering warm support for his guest, Tusk said the European Union “will not gamble with peace” on the Irish border by removing the backstop from the deal. “I hope that tomorrow we will hear from Prime Minister May a realistic suggestion on how to end the impasse,” he said. 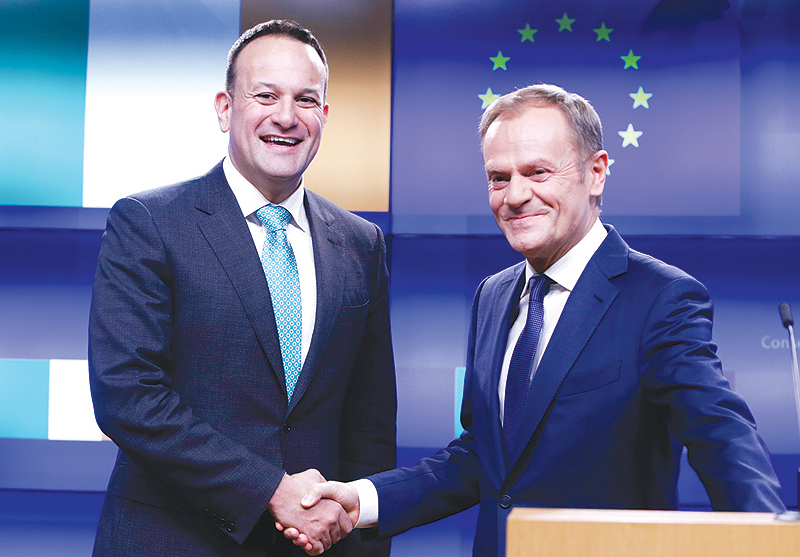 And Tusk added: “A sense of responsibility also tells us to prepare for a possible fiasco.” Varadkar, whose government has stressed the importance of maintaining an open border between Ireland and Northern Ireland after Brexit, thanked Tusk. “While we expect the backstop will never be used, we agreed again today it is needed as a legal guarantee to ensure there is no return to hard border,” he said. May fears she will not be able to command a majority in the House of Commons to ratify a withdrawal that binds Britain into a customs union until the border issue is resolved. Yesterday, she discussed the issue with Northern Irish leaders in the British province before her difficult visit to Brussels to confront a sceptical Juncker and Tusk. Last month, the House of Commons overwhelmingly rejected the Brexit deal that May had negotiated with the EU over 18 months of painstaking high-stakes diplomacy. May is now looking into changes to satisfy her MPs, who fear the backstop would keep Britain indefinitely tied to EU rules with even closer alignment for Northern Ireland. Speaking in Northern Ireland on Tuesday, May vowed to seek a solution that keeps the border open and preserves the peace that ended years of violence in the British province.